Amelia & Mitchell Wray. Courtesy of Chauncie Wray. Used with permission. 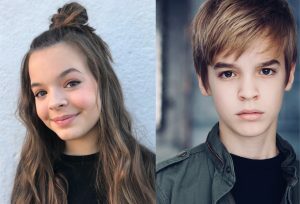 For anyone who has seen them perform in local theatre it has almost been a far-gone conclusion, especially for their numerous fans, that Amelia and Mitchell Wray are destined for great things in the entertainment world. Now, it appears that prediction is coming true, if their recent career opportunities are any indication. Recently, I caught up with the 13-year-old twin daughter and son of Chauncie and Cory Wray at their Carmel home, where they spent the holidays prior to returning to L.A., where they are pursuing careers in film and television. Mitchell and his mom moved to L.A. in July of 2017 after he finished the national tour of “Finding Neverland,” which began in September 2016. In the show, he played first, Jack and later, Peter. After finishing her turn in the Phoenix Theatre smash hit of “Fun Home” in January of 2018, Amelia joined her brother and mom, returning temporarily in July for a run of “Secret Garden,” presented by Summer Stock Stage, in which she starred as Mary Lennox. Amelia is in a recurring role on Disney Channel’s “Sydney to The Max,” about a young girl named Sydney and her dad Max. Her character, Sophia, a friend of Sydney’s, is introduced in episode ten. The show debuts at the end of January. “The first day on set, I was so excited, but also nervous because it was my first Disney Channel project. The kids were the nicest people I have ever met. They are all so humble, have great parents and they all work so well together. We know when to have a good time, but also when to be serious. One time, when they cut the cameras and the producers were talking, I remember staring into space thinking, ‘Whoa, this is weird. This is going to be on TV, on the Disney Channel.’ It was just a surreal moment. I was excited for the new journey and ready for it,” Amelia exclaimed. In addition to the twins’ current projects and since it is pilot season, they are auditioning for TV shows and other projects they did in the past are just now bearing fruit. One is a short film Mitchell starred in, which he shot a year and a half ago, called “Play Date,” which just made it into the Kids First Film Festival in New Mexico. A project, which Mitchell did a reading of last year, may soon provide him with industry exposure. Titled “Irena Sendler, The Musical” by Megan Cavallari and Kait Kerrigan, the production is directed by Jonah Platt, brother of “Dear Evan Hansen” star Ben Platt. Benefiting the Los Angeles Museum of the Holocaust, the musical tells the story of a Polish woman who risked her life to save over 4,000 children during the Holocaust. The performance, featuring the Los Angeles Jewish Symphony, conducted by Maestro Noreen Green to celebrate Holocaust Remembrance Day, will be held January 26 and 27 at the Los Angeles Museum of the Holocaust. Follow both Amelia and Mitchell Wray on Facebook, Twitter and Instagram. Tom Alvarez is a freelance writer who has covered theater, dance, music and the visual arts for 40 years. He has written for the Indianapolis Star, NUVO Newsweekly, Indianapolis Monthly, Arts Indiana, Unite Magazine, Dance Magazine, Examiner.com and other publications. Tom appears regularly as a contributor on WISH-Channel 8's "Indy Style." A principal of Klein & Alvarez Productions, LLC, he is co-creator of the company's original "Calder, The Musical" and managing director of its Magic Thread Cabaret. For information regarding both endeavors, visit www.kleinandalvarez.com. Also an actor/model, Tom is represented by the Helen Wells Agency and Heyman Talent Artists Agency. (c) 2018 Tom Alvarez. All Rights Reserved.